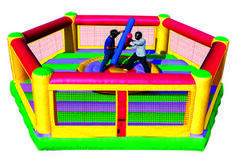 Our Gladiator Joust brings on a new level of competition and is a great interactive game rental. Our free floating rocking pedestal platform heightens the jousting experience. An inflatable joust is a clasic and great for spectators as well. Netted side walls keep the players in the game. The safest unit on the market. Comes with 2 padded joust poles, and 2 head gear. Hop N Party is Austin's inflatable joust rental shop. All of our inflatables are cleaned and sanitized after each rental. Hop N Party is fully insured and inspected. If your looking for the best bounce house company in Austin then your search is over! Hop N Party has been proudly serving Austin since 2011. Book Your Inflatable Joust Today With Our Easy Online Reservation System!